He was a man of the people and spent all his working life in Wolverhampton fighting for the Irish immigrants of Carribee Island and the poor in other deprived areas of Wolverhampton. 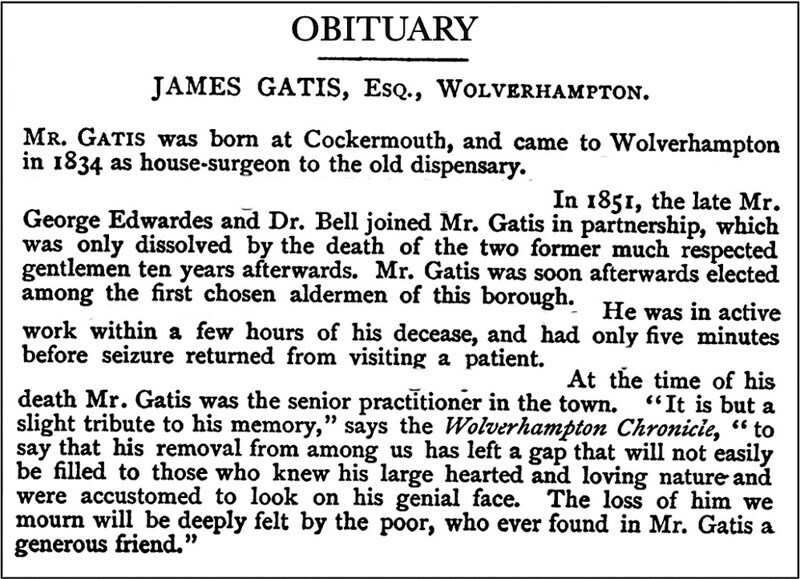 “[A man] whose loss will be deeply felt by the poor, whoever found in Mr. Gatis a generous friend,” so wrote the Wolverhampton Chronicle, on his death in 1872. And yet, I would think 90% of townsfolk today have never heard of him. In the suburbs of Victorian Wolverhampton there were many large and handsome townhouses, with tasteful gardens, which belonged to the eminent gentry of the day. One such house in Charles Street, was the home in 1840 of James Gatis. 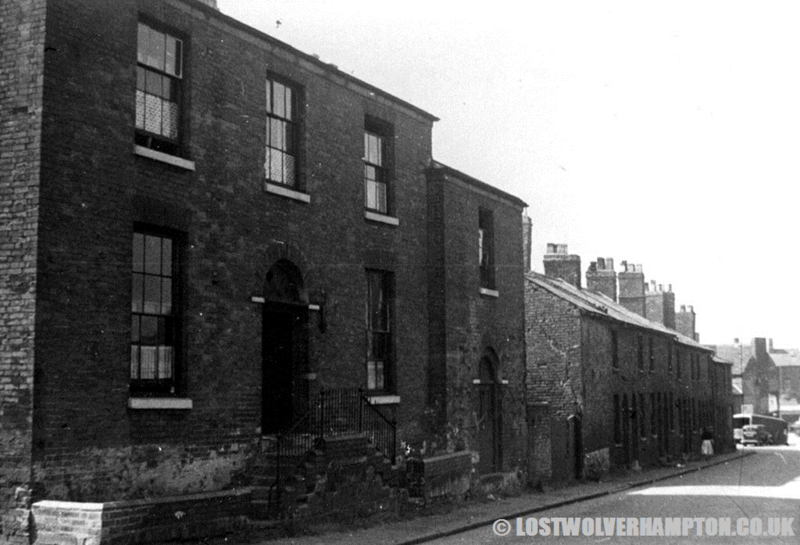 The position of the area occupied by Charles Street – between Stafford Street and North Street – meant it had a connection for some time and had seen life in Wolverhampton since the middle of the 18th century. It was shown on Isaac Taylor’s map of 1750, as ‘Four Ashes’, but soon after it became, “Charles Street”. 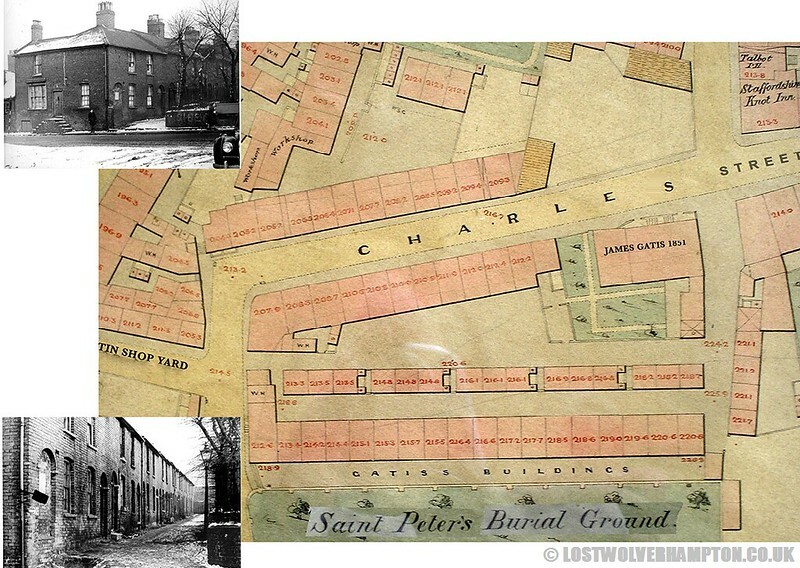 The image above shows a map from 1875, which reveals both the site of Dr Gatis’s house in Charles Street and the row of terraced houses that adjoined the bottom St Peter’s Burial Grounds. These were called “Gatis’s Buildings” after this benevolent man who was held in such high esteem. Older readers may also recognize the two small photos on the left (circa 1953), especially if you lived locally or attended St Peters Schools at that time. The top photo shows North Street, looking from “The Fox Inn”, across what was once “Tin Shop Yard” and on into St Peter’s Square. Charles Street is just out of view on the left of the building with the raised steps of the former, now de-licensed, “Three Crowns Inn”. At the right of this stand the sixteen terraces once known as Gatis buildings, but now simply “Court 3”. On the far right was St Peter’s Collegiate Schools. The bottom photo shows a close up of the former Gatis’ buildings, with what’s left of the old burial grounds and the corner of the schools in St Peter’s Square. I had been inside this formidable, but neglected and dreary residence many times, as it was the last Sunday morning call on my daily paper round. Once I had the paper money safely in my pocket, I would leave as fast as I could as it was such a foreboding place. But who exactly was the man who lived here and what was it that meant buildings were named after him? And, of course, how is he connected to Carribee Island? James Gatis was born in Cockermouth in 1811 and moved to Wolverhampton in 1834. He would assume the position of house-surgeon at the now-relatively young age of 23. In Gatis’ time, Carribee Island was much like large sections of the town in those days; life was tough and often violent and disease ridden., with Typhoid and Cholera running rife. The mortality rate in Carribee Island was high and Gatis was witness to it here and in other poor parts of the town. 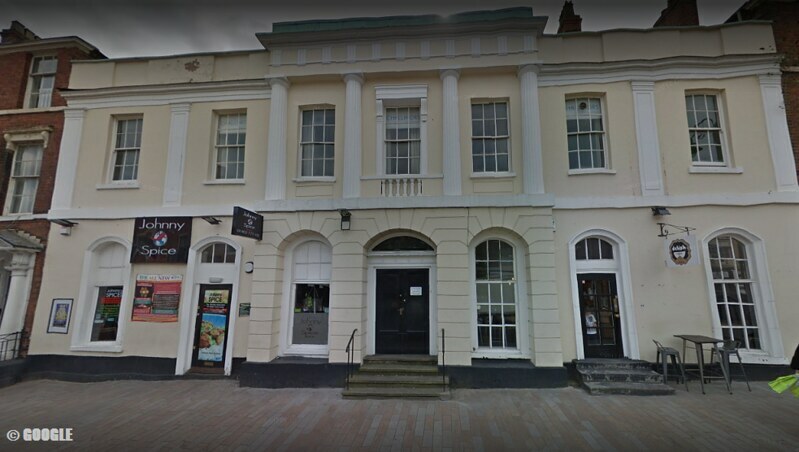 In 1840, a public report outlined the squalid and unsanitary conditions endured by many poor Irish families and Gatis wrote a letter to the Wolverhampton Chronicle in disgust, stating nothing had been done to eradicate the evil conditions. 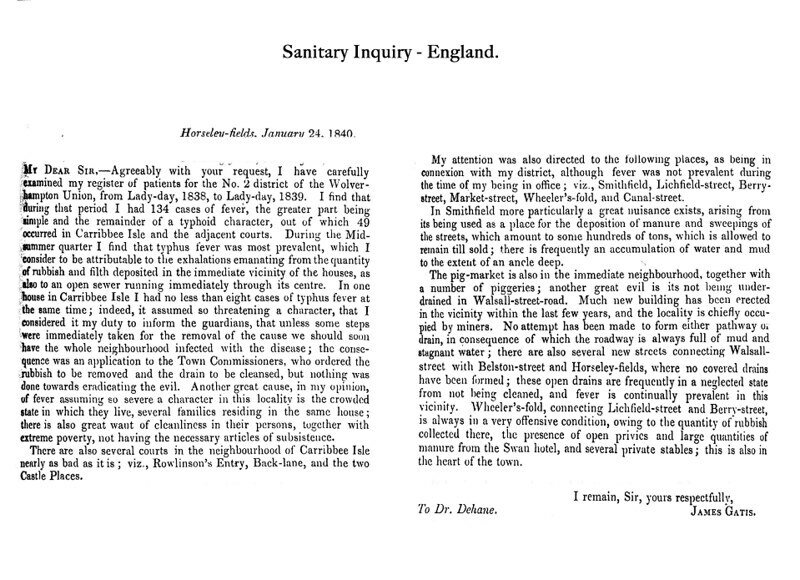 As a member of the board of inquiry reporting to the General Board of Health on the towns of Wolverhampton, Bilston, Willenhall and Wednesfield, Gatis wrote and sent his report to Doctor Dehane. head of the committee. Gatis noted that in a one-year period between 1838 and 1839, that a staggering 37% of all fever cases he had treated had been for individuals living in Carribee Island or its surroundings. Further, he noted that typhus was especially prevalent in the midsummer months, attributing this to “the exhalations emanating from the quantity of rubbish deposited in the immediate vicinity of the houses” and “an open sewer running through its centre”. One house was said to have eight cases of typhus, an outbreak he considered so serious that unless the source was tackled, the entire neighbourhood would be struck down with the dreadful disease. An application was made to the Town Commissioners to remove the filth and rubbish, but little was done. Furthermore, another significant factor in the problem was the sheer overcrowding in this poor, immigrant neighbourhood. Many houses would be home to several families at one time and meant that any infectious disease would spread even quicker, passing from one unsanitary individual to another with frightening speed. 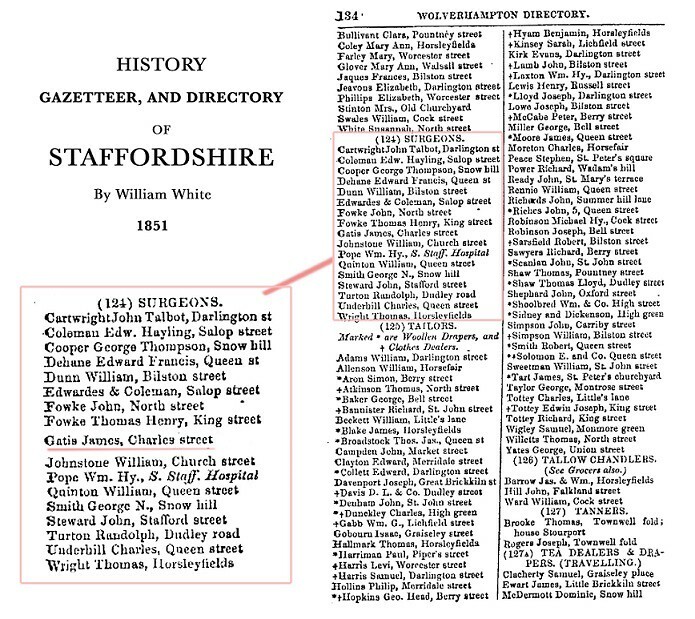 Gatis would go on to list many other neighbourhoods of concern in the Victorian town; Smithfield, Lichfield Street, Berry Street and Wheeler’s Fold to name but a few. All of these areas were afflicted by a combination of similar factors – open sewers, overcrowding, depositing of manure (often from the horses of the town’s richer classes) and the slaughter and preparation of animal products. Doctor Gatis would pass away in 1872 at the relatively young age of 61, but it would not be until the late 1880s and the coming of the Artisans Dwelling Act that the whole area of Carribbee Island was demolished and rebuilt. It is a great pity this man didn’t live to see the fruits of his labour. A Wolverhampton gentleman in every sense of the word, whose persistent course of action in spite of difficulty would eventually lead to improvements in the town’s public health. Should you ever wish to walk in this great man’s footsteps, then you may find it a challenge, however. 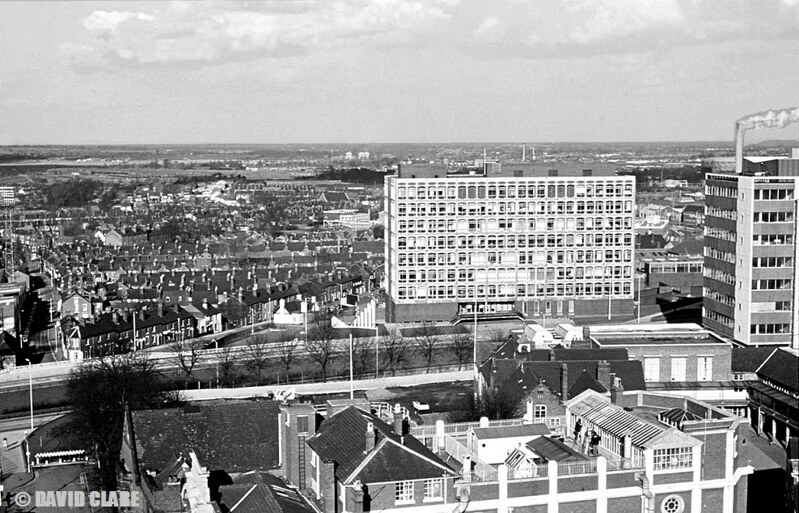 This view was taken in the 1970s, but the view now would be somewhat similar. The dual carriageway of the ring road now takes the exact line of Charles Street, but on the far left, Molineux Street and North Street have yet to be built on as the extensions to Molineux Grounds. Now if you take a line from top to bottom of the scene in the middle of the carriageway to the left of the Art College would have been the site of James Gatis’s house. So, Gatis was a great surgeon, who fought for the rights of those in Carribee Island and other poor areas of the town. But can you believe there was opposition? You will have to give me their names Jackie perhaps I may recall them. Hi Rosemary – All though Montrose Street was shown on the 1842 Wolverhampton Tithe Map there were only a few buildings at that time nothing much regarding housing. The slum district of Carribee was really limited to the area from Stafford Street east as far as Carbery Street (Westbury Street).